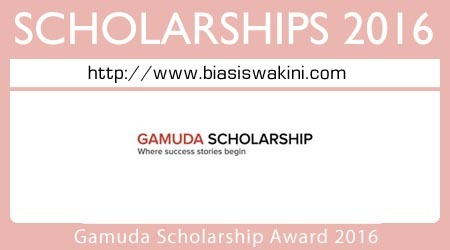 With our ambition to develop well-rounded and capable individuals to drive the group’s growth, the Gamuda Scholarship Award Programme 2016 was created to provide young deserving students the opportunity to complete their studies, while honing their inner development to become future leaders of the Group. -Must not be a recipient of a scholarship, loan or financial assistance from any other organization. 0 Komentar untuk "Gamuda Scholarship Award 2016"